Everything you wanted to know about bird watching but didn't know who to ask (in a convenient A-Z format). 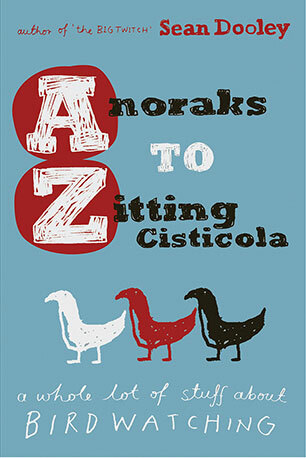 Anoraks to Zitting Cisticola is a guide to the secret world of birdwatching. It has all the stuff the real guides don't tell you: how to look cool in binoculars, how not to get stuck with a bird bore, how to start your own bird list, what not to wear, whether birds have penises and so on. Using an alphabetic template, it's an insight into the language, behaviour, haunts and habits of both birders and birds. Ranging far and wide, Sean covers birdwatching from the perspective of environmental issues, politics, literature, sociology and ornithology, all with a deft touch that both informs and entertains. So whether it's A for Anoraks, P for Parabolic Grot, S for Shakespeare (Romeo and Juliet contains the first argument over bird identification ever recorded) or G for Gonads, this A-Z is a must for the amateur, the wannabe or fanatical birdwatcher. And it's guaranteed to keep even the most casual bird nerd amused. Sean Dooley is a Melbourne author who has worked as a television comedy writer. He is a contributor to The Age, ABC radio and 3RRR, writing and talking about birds, environmental issues, sport and, well, anything, really. But his greatest claim to fame is that in 2002 he broke the Australian birdwatching record for seeing the most species in the one year. He then wrote about it in The Big Twitch, thereby publicly outing himself as a bird-nerd.